I had a great time at Book Rack perusing the shelves and finding wonderful new friends (books.) The manager was knowledgeable and very helpful. Have already recommended it to my husband. Will be back! The Book Rack has enticed me for years with their window displays but I have always been there late at night when it wasn’t open. Today I got inside! The shelves are well organized and bursting with good quality books waiting to be read. The staff were friendly and helpful but not intrusive to my browsing. Can’t wait to go back again! Thanks! Excellent selection, super staff. We'll be back. The Book Rack is a wonderful resource. The staff is extremely helpful. I always enjoy browsing there! Didn’t know about this place. Will absolutely come back. Awesome book store. The selection of new and used book are impressive as well as the staff. Great experience! Great place. Staff was helpful. What a fun shop! I could have spent hours there. I like the atmosphere and the selection of books. It is a great little book store. Had some great new books and great deals on used books! a really well-run independent bookstore. Pleasant, helpful, knowledgeable staff. Will definitely go back. Helpful and friendly staff, wide selection of books. I took my granddaughter who is almost 16 to the bookstore for the first time. She loved the fantasy section in particular and was thrilled to find a prequel to Game of Thrones by George Martin. I know she will be returning often. This place is great! Highly recommend. What a great used bookstore. This was my first visit to The Book Rack in Arlington. It was fun to browse the large selection of books, and buy several. Very friendly staff, too. Very friendly and knowledgable staff. An excellent selection of books and an inviting environment. The Book Rack is a fantastic find! A one of a kind book store that sells used and new books and other items such as greeting cards, book marks and journals. Excellent friendly and helpful staff members to help you navigate the store especially as I was a first time client. I told them I will be back and will bring friends!! They have a great variety and it’s nicely organized. Pricing is good. I like that they carry both new and used books. The staff was friendly and helpful. The Book Rack is always wonderful, the staff is very knowledgeable and helpful. My family loves the book rack. I was no table to rank it below, please note that I want to give it a 5. I went to the Book Rack first time. There are so many books and I had fun time! Thank you!! This was my first time here, yet Book Rack is walking distance from my home! My kids were excited to find great new books. My mom, who loves book stores, thought this one was very organized and good prices. We loved it! Great little book store and friendly staff. They are so nice here! Great store, great book selection. I'll go back to either sell or buy books to them! I hadn't been into Book Rack in six or seven years, so when I received the Nift it was a delightful reminder of this sweet little neighborhood bookstore, something I always enjoy. What a terrific place: nice selection of new books, beautifully organized used books of every category, and friendly helpful staff. Thank you! Fabulous, clean, fun local bookshop! Thank you!! It was truly a treat to go into the Book Rack and walk out with 2 books for FREE! Thank you! Loved the personal attention in book selection for my grandson! Friendly and ordered a book for me. This was an awesome bookstore. I was pleased to see that it was crowded. The salesperson was very knowledgeable about the books they had. My daughters and I will definitely return again. The store sell new and used books. I found many used books in great condition along with great prices. I will come to look again. There are so many books. The Book Rack is a great store and we love shopping there. Cozy, friendly and unintimidating little store that packs a lot into a small space! Staff are knowledgeable and helpful - they helped me avoid a wrong purchase. Lots of used books and great prices! Thanks, they helped me find the book I was looking for, and it was fun to poke around! Great used book shop! The registers had a little trouble but the people were nice! Inventory selection seems best for those seeking out fiction in the mystery or romance/historical romance genres. There's also non-fiction, other contemporary/general fiction and small section for cookbooks. Also some kids' books and other things. They did have issues processing the purchase of someone before me though...he had both a Nift and gift card and they spent at least 10 minutes trying to make the gift card go through for the purchase. Fortunately, I wasn't in a rush. The Book Rack is a gem of a bookstore and the community is fortunate to have it. Staff at the Book Rack were very friendly and helpful. Thank you! A fun place to explore around looking for good reads! This is such a cute store. It is not that big but packed with books. I took my son there and he was delighted with the children book section. Thank you for your help & info! Will definitely be back! The gentleman behind the counter was wonderful! He did a great job recommending other authors that I might be interested in based upon my reading preferences! Will be returning! Free money is always awesome, and the chance to try a new local business. Love this place. Such a gem of a store. Thrilled to see them as nift choice. Great store! Super friendly staff that are always willing to go the extra step to help you find what you are looking for! I'm glad Nift pointed me to this bookstore. I didn't realize there was one so close to me. They have a good selection and fair prices. Very friendly. 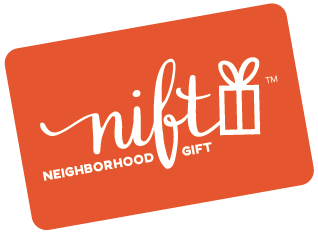 Easy to use Nift. Great find. Interesting people. Good prices. They had a nice selection and they were helpful finding the book I wanted. The salesperson was helpful and we enjoyed looking through the selection of books and choosing some to take home. The Book Rack is a great place to look if you are trying to support a small business and get a great new or used book for your commute. It's right off of many bus routes and super has excellent sources of parking because there is a large municipal parking lot dclose by. Charming little bookstore with plenty of affordable titles. I am pleased that my Nift certificate led me to discover this business; found three books by favorite authors that I haven't read. I would recommend the Book Rack highly. Unfortunately the feedback scale seems non-functional. I cannot select a number - would select #5 if I could. Loved the mix of used and new kids books and games! knowledgable - owner gave me a great recommendation for a book for my daughter! I am so happy I discovered book rack! They have an amazing selection if books and even take books to consign. I will definitely be back and wouldn't have known about them without Nift. My favorite used book store in Arlington. I got 4 books and got $10 off. The BookRack is a great store...used and new books and lots of selections for everybody! this is one amazing place! !